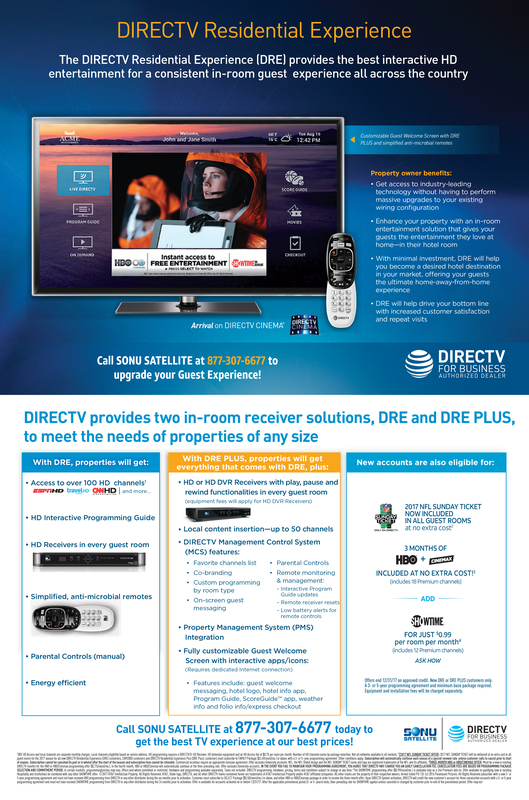 The DIRECTV Residential Experience is truly the cutting edge of commercial satellite TV for business, but did you know about DRE Plus? The standard Residential Experience already offers your guests and patrons access to over 100 HD TV Channels, the residential interactive programming guide, parental controls, and a dedicated receiver in every room. These great strides in commercial TV for business systems have garnered wildly positive reviews from hotel guests and business patrons across the country. So, how could the DRE Plus Package really make this experience better? The DIRECTV Residential Experience (Plus) takes the standard DRE offerings, and opens the door for every bell and whistle available. Guarantee your guests will have a memorable experience by offering HD DVR to every room. Allow your customers to Fast Forward, Rewind, and Record the DIRECTV programming available during their wait or stay. Your business class guests will be able to record their favorite movies, tv shows, or sporting events while attending business meetings in the local area. Keep them informed on your business area by receiving up to 50 Local Channels. Your patrons will love DRE Plus! What about how the DRE Plus can help your branding? This brilliant TV for Business package isn’t just designed to wow your guests, it has been built to aid with your marketing as well! With DRE Plus, your company will gain access to the exclusive DIRECTV Management Control System. Every TV becomes equipped with a fully customisable Guest Welcome Screen with interactive apps/icons. Features include guest welcome messaging, hotel logo, hotel info app, Program Guide, ScoreGuide™ app, weather info and folio info/express checkout. Just when you thought your TV for business experience could not get any more professional, the DIRECTV Residential Experience Plus raised the bar! Activate your DIRECTV (DRE) TV for Business package with Sonu Satellite, and you may qualify for additional special offers.